I had the opportunity to see Julie & Julia this past weekend. 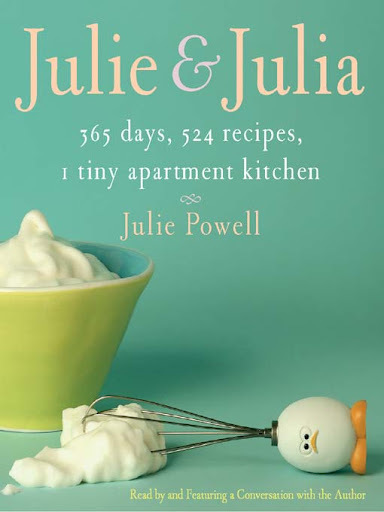 The movie was two-fold; a glimpse into famous chef Julia Child’s life and a woman who was on the search to complete a book of Julia’s recipes in one year. I totally related to Julie: government employee by day and an aspiring writer by night. She never finished anything and was growing increasingly numb by her day-to-day job. Encouraged by her husband, she began a blog combining her two passions: cooking and writing. In the end, the blog proved successful as it was turned into a book and ultimately a feature film. The movie mostly spanned the time when Julia Child’s lived in France with her husband; detailing her struggles to enroll in male dominated schools, fitting into a new culture (not speaking the language), and her quest to get her book published. I only knew Julia Child’s from her TV show and spoofs on various television shows, but the movie shed a new light on an American icon. She lived an extraordinary life and is an inspiration to all women: following dreams, breaking boundaries, and determination. It was because of this movie that I sat down and started my blog (which has been on the back burner of my “to do” list for a long time). Please note, I did not read the book.